Simplify and speed up the process from quote to delivery and final invoice. Find out how invoicing can be simple and functional using Backstore. Reserve quantities using quotes and simplify the whole process from quote to delivery and final invoice. Track and manage advance payments with ease. Quickly create final invoice upon delivery of goods. Be compliant when invoicing within the EU. Backstore automatically adds VAT specific notes when needed. Create invoice from quotes, advance payments or service orders, copy an existing invoice or quickly create a new one from scratch. Using the powerful Word templates create your unique design for invoices, quotes, delivery notes, service orders and other documents. ECB exchange rates are automatically applied to invoices and quotes which are not in your national currency. Creating an invoice from quotes and delivery notes is quick and easy. 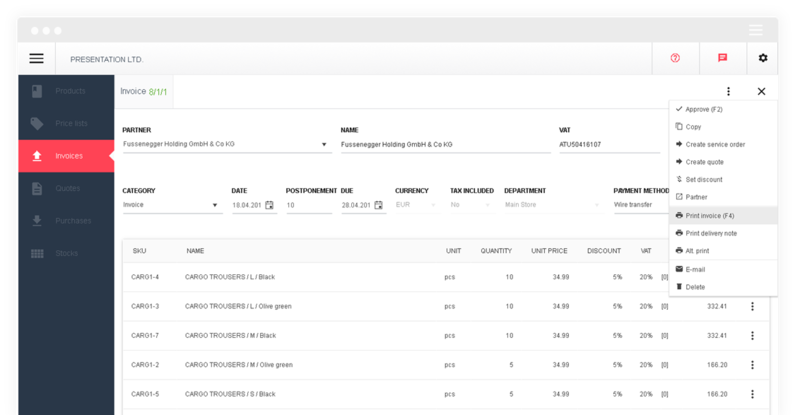 Bar codes, powerful inventory search and keyboard shortcuts help you create an invoice from scratch. Track and manage multiple advance payments with ease. Quickly create final invoice upon delivery of goods. With powerful Word templates you can completely customize documents such as quotes, invoices, delivery notes and service orders.